I'm a big fan of Working Class Foodies (http://www.hungrynation.tv/wcfoodies) and in one of their episodes, they make a dish inspired by the Bo Ssam at Momofuku. 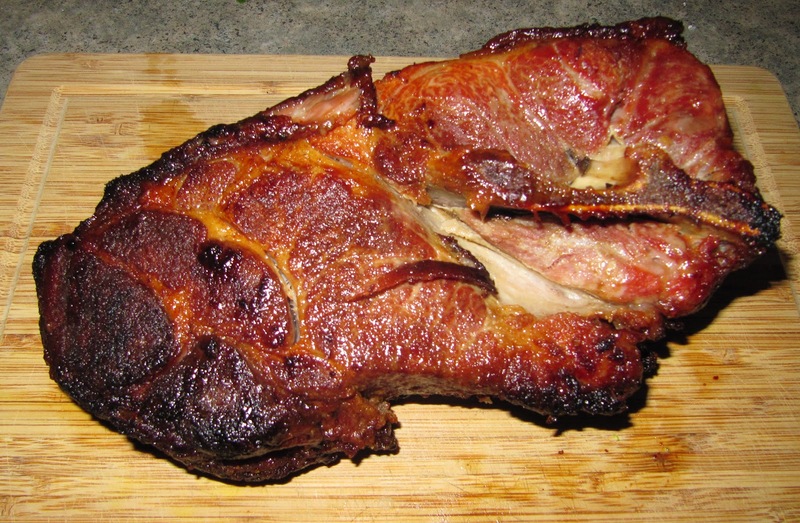 Being a fan of roasting pork, I knew I had to make my own version at home. Bo Ssam is a Korean dish consisting chunks of pork in bibb lettuce with various condiments on the side. For my version I decided to make a ginger-scallion sauce and a one day version of kimchi that I tried out. As an additional side I also prepared a cold noodle salad with shrimp. 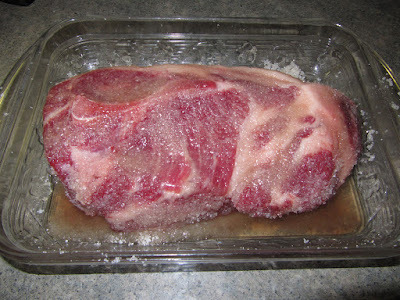 To begin, I rubbed a pork shoulder roast with a combination of sugar and sea salt and let this sit for a few hours. I then placed the roast in the oven for 4 hours, making sure to baste the pork in its drippings every hour until it was tender enough to shred with a fork. 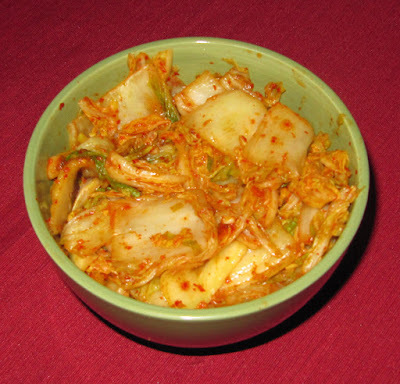 While the pork roasted I also prepared a quick one day kimchi recipe. 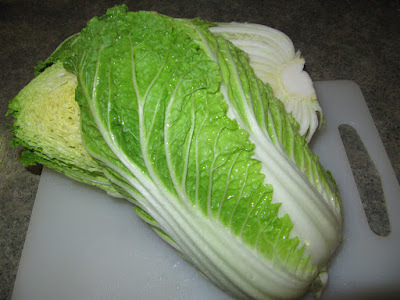 To begin I quartered a large head of napa cabbage lengthwise then cut into large chunks crosswise. 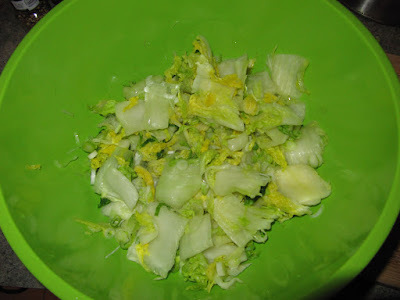 I placed the cabbage in a large bowl along with a cup or so of coarse sea salt. I let this sit for a couple hours to draw out as much water from the cabbage as possible. To complete the kimchi, I rinsed the cabbage to get out any excess salt and I squeezed by hand to get out any additional water. In a food processor I blended garlic, ginger, soy sauce, vinegar and red pepper flakes until a loose paste formed. I tossed this mixture with the cabbage until completely covered and let sit for another two hours. 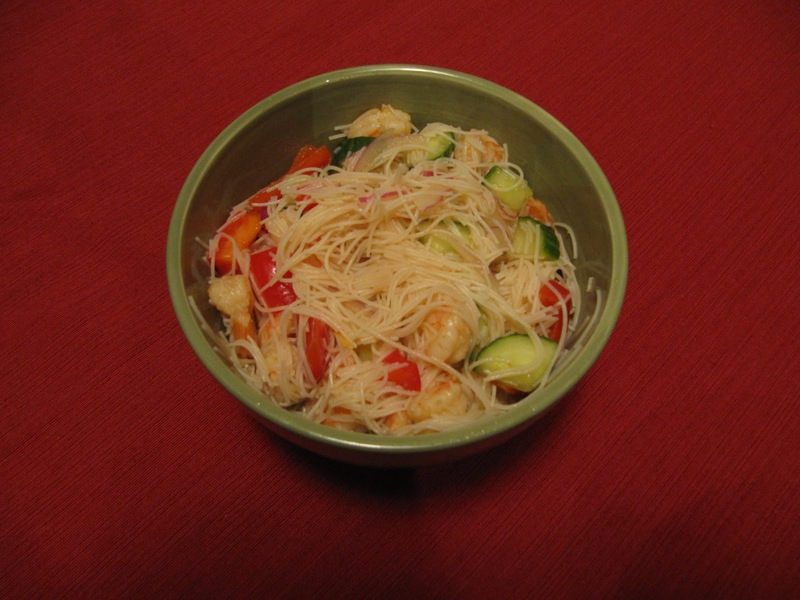 To prepare the noodle salad I combined in a large bowl softened rice vermicelli noodles, cooked shrimp, cucumber, red pepper, and onion. For the dressing I combined soy sauce, vinegar, ginger, garlic, hoisin, lime juice, sugar, and some red chili sauce. The noodle salad was a bit more Vietnamese inspired but went well with the pork. To prepare the ginger scallion sauce I first fried minced garlic in sesame oil until browned and crispy. I combined this in a bowl with ginger, scallions, soy sauce, rice vinegar, and thinly sliced serrano chile to add some spice. 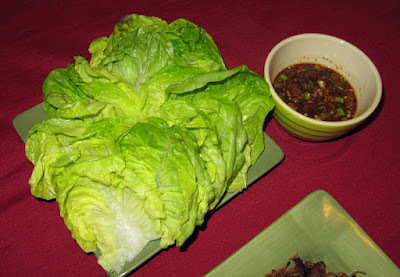 To wrap the pork I carefully pulled the leaves off of a few heads of bib lettuce and rinsed. The leaves are the perfect size for stuffing with pork and condiments. To complete the meal I shredded the pork meat and placed in a large plate with the lettuce and condiments all around. This was a very exciting meal to make as well as to eat. 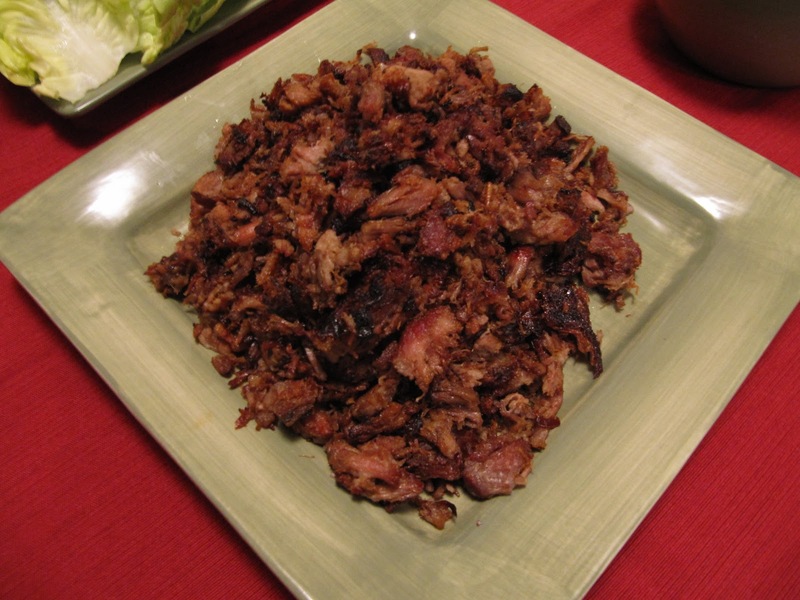 The pork and condiments went well together and were full of flavor. 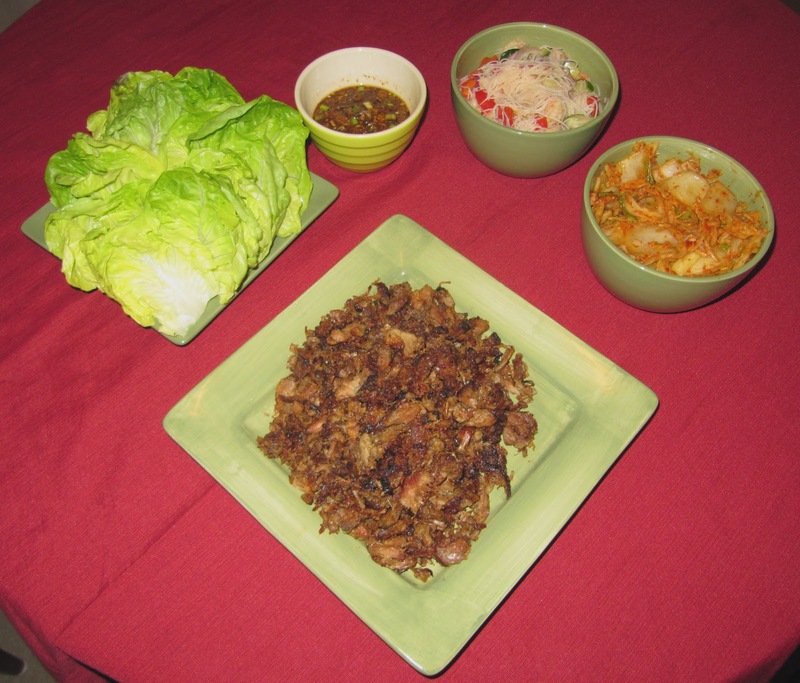 The sauce did a good job of cutting the fatty saltiness of the pork and the kimchi added a nice element of flavor to the dish. The noodle salad was was very flavorful as well making it a great side dish. Made in large quantities this dish can be a crowd pleaser and I will definitely be making a larger version of this for a party some time in the future.